order this book online Robert Burns, Scotlands National Bard, is known all over the world. His poems are recited in Russia, where he is honoured as a the common people's poet, and his songs will always be performed by folk singers. Every year in January hundreds of thousands of people celebrate Burns Night, attending Burns Suppers and enjoying the traditional haggis, neeps and tatties, washed down with a few drams. A great admired of William Wallace, Burns borrowed a line from Blind Harry's 'Wallace' for his 'Scots Wha Hae'. In recent years Randall Wallace returned the compliment by using Blind Harry's epic poem as the basis for this Braveheart screenplay, and using the words of Robert Burns when The Bruce urges his followers to 'now bleed with me' before the Bannockburn battle at the end of the movie. Robert Burns was born in Alloway in Ayrshire in 1759, the son of a poor farming family. His education lasted until he was about nine, when he was put to work on the farm. When he was eighteen his family moved to another farm near Tarbolton and Burns, who had tried to read as widely as possible, discovered the poetry of Robert Ferguson. During the next few years he wrote his own poems while helping his ill father until he died in 1784. Robert, as the eldest son, tried to run the farm himself, but could not make a success of it, and eventually handed it over to his brother. He collected subscriptions to have a book of his poems printed, and a the Kilmarnock edition, containing 612 poems, mostly in Scots, was printed and sold out within a month. 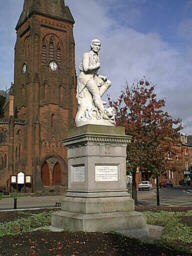 Robert Burns statue at Dumfries The success of the book brought him to the attention of Doctor Blacklock in Edinburgh. Burns was invited to the capital to be acclaimed by society. While he was there, arrangements were made for a second edition of his book and with the money he earned from this he moved to a new farm near Dumfries in 1788, taking with him his wife Jean Armour. Once again however, his efforts at farming failed. With a new baby to be looked after, Robert had to take a job as a Customs Officer. He was later transferred to Dumfries itself, and his output of poems and songs reached its peak. His work, influenced by the poverty around him, became more openly political. As a supporter of the French Revolution, he alienated many who might have othewise been able to help him, and he came under threat of arrest for treason and sedition. In 1796 his health declined seriously. Jean nursed him, but he died in the July of that year, now knowing that his debts had been cleared by friends. Carol McGuirk, the editor of Robert Burns : Selected Poems has been Professor of English at Florida Atlantic University since 1990.